, bishop of Lichfield and Coventry, descended from an ancient family in Scotland, was born near Exeter-house in the Strand, London, September 1, 1592. 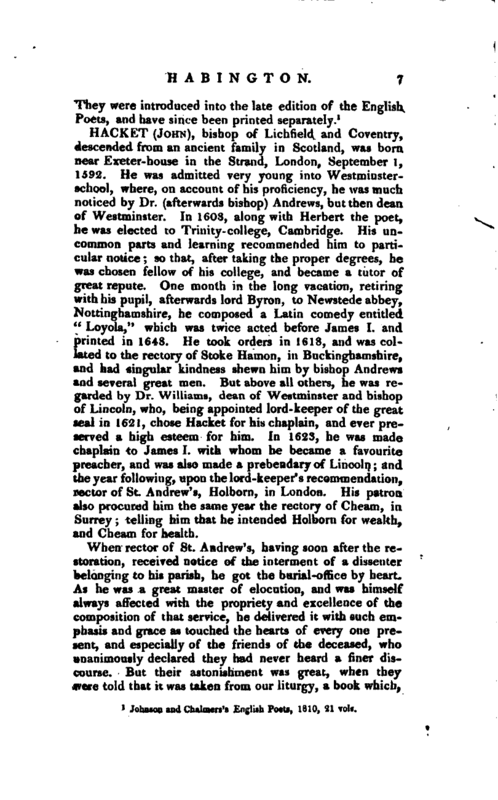 He was admitted very young into Westminsterschool, where, on account of his proficiency, he was much noticed by Dr. (afterwards bishop) Andrews, but then dean of Westminster. 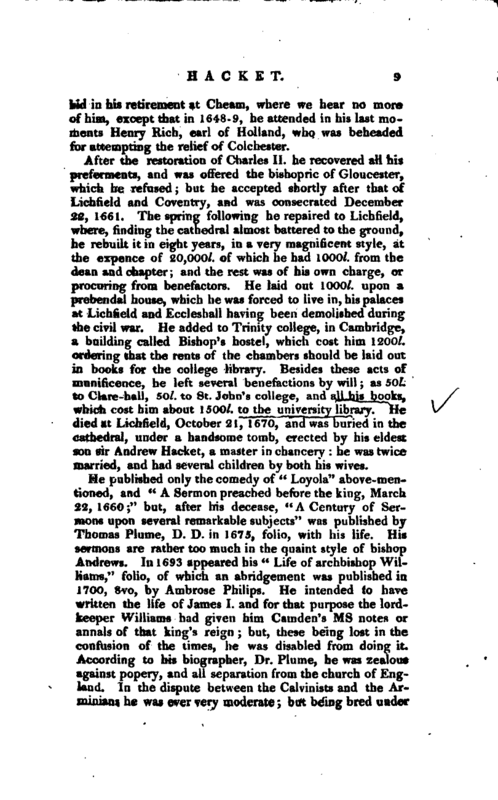 In 1608, along with Herbert the poet, he was elected to Trinity-college, Cambridge. 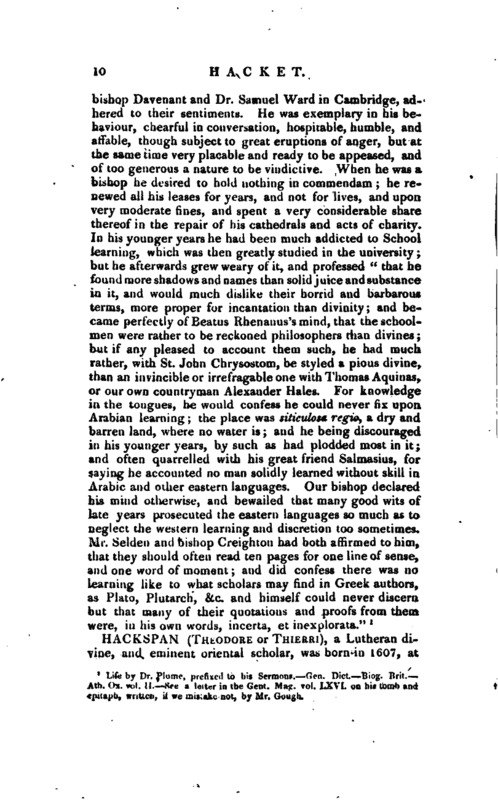 His uncommon parts and learning recommended him to particular notice; so that, after taking the proper degrees, he was chosen fellow of his college, and became a tutor of great repute. One month in the long vacation, retiring with his pupil, afterwards lord Byron, to Newstede abbey, Nottinghamshire, he composed a Latin comedy entitled “Loyola,” which was twice acted before James I. and printed in 1648. He took orders in 1618, and was collated to the rectory of Stoke Hamon, in Buckinghamshire, and had singular kindness shewn him by bishop Andrews and several great men. But above all others, he was regarded by Dr. Williams, dean of Westminster and bishop of Lincoln, who, being appointed lord-keeper of the great seal in 1621, chose Hacket for his chaplain, and ever preserved a high esteem for him. In 1623, he was made chaplain to Jame$ I. with whom he became a favourite preacher, and was also made a prebendary of Lincoln; and the year following, upon the lord-keeper’s recommendation, rector of St. Andrew’s, Holborn, in London. His patron also procured him the same year the rectory of Cheam, in. Surrey; telling him that he intended Holborn for wealth, and Cheam for health. When rector of St. Andrew’s, having soon after the restoration, received notice of the interment of a dissenter belonging to his parish, he got the burial-office by heart. As he was a great master of elocution, and was himself always affected with the propriety and excellence of the composition of that service, he delivered it with such emphasis and grace as touched the hearts of every one present, and especially of the friends of the deceased, who unanimously declared they had never heard a finer discourse. But their astonishment was great, when they were told that it was taken from our liturgy, a book which, | though they had never read, they had been taught to regard with contempt and detestation. This story, but without the name of Dr. Hacket, for which we are indebted to Mr. Granger, is circumstantially told in bishop Sprat’s excellent “Discourse to his Clergy,” 1695. The worthy bishop Bull, when a parish priest, is known to have practised the same honest art with like success, in using other offices of the liturgy. In 1625 he was named by the king himself to attend an ambassador in to Germany; but was dissuaded from the journey by being told, that on account of his severe treatment of the Jesuits in his “Loyola,” he might be in danger, though in an ambassador’s train. In 1628, he commenced D. D. and in 1631 was made archdeacon of Bedford, to which charge he usually went once in a year, and frequently exhorted his clergy “to all regular conformity to the doctrine and discipline by law established, without under or overdoing, asserting in his opinion, that puritanism lay on both sides; whosoever did more than the church commanded, as well as less, were guilty of it; and that he only was a true son of the church, who broke riot the boundals of it either way.” His church of St. Andrew being old and decayed, he undertook to rebuild it, and for that purpose got together a great sum of money in stock and subscriptions; but, upon the breaking out of the civil war, this was seized by the parliament, as well as what had been gathered for the repair of St. Paul’s cathedral. In March 1641, he was one of the sub-committee appointed by the house of lords to consult of what was amiss and wanted correction in the liturgy, in hopes by that means to dispel the cloud hanging over the church. He delivered a masterly speech against the bill for taking away deans and chapters, which is published at length in his life by Dr. Plume. In March 1642 he was presented to a residentiary’s place in St. Paul’s, London; but the troubles coming on, he had no enjoyment of it, nor of his rectory of St. Andrew’s. 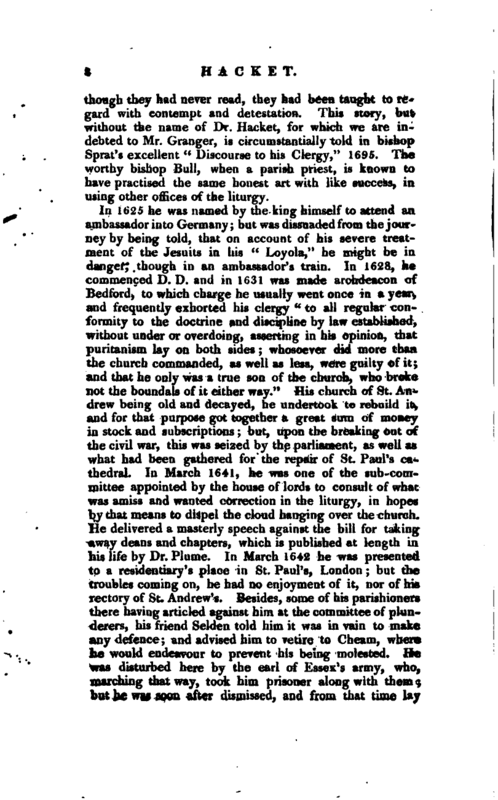 Besides, some of his parishioners there having articled against him at the committee of plunderers, his friend Seltlen told him it was in vain to make any defence; and advised him to retire to Cheam, where he would endeavour to prevent his being molested. He was disturbed here by the earl of Essex’s army, who, marching that way, took him prisoner along with them; but he was soon after dismissed, and from that time lay | hid in his retirement at Cheam, where we hear no more of him, except that in 1648-9, he attended in his last moments Henry Rich, earl of Holland, who was beheaded for attempting the relief of Colchester. After the restoration of Charles II. he recovered all his preferments, and was offered the bishopric of Gloucester, which he refused; but he accepted shortly after that of Lichfield and Coventry, and was consecrated December 22, 1661. The spring following he repaired to Lichfield, where, finding the cathedral almost battered to the ground, he rebuilt it in eight years, in a very magnificent style, at the expence of 20,000l. of which he had 1000l. from the dean and chapter; and the rest was of his own charge, or procuring from benefactors. He laid out lOOOl. upon a prebendal house, which he was forced to live in, his palaces at Lichfield and Ecclestiall having been demolished during the civil war. He added to Trinity college, in Cambridge, a building called Bishop’s hostel, which cost him 1200l. ordering that the rents of the chambers should be laid out in books for the college library. Besides these acts of munificence, he left several benefactions by will; as 50l. to Clare-hall, 50l. to St. John’s college, and all his books, which cost him about 1500l. to the university library. He died at Lichfield, October 21, 1670, and was buried in the cathedral, under a handsome tomb, erected by his eldest son sir Andrew Hacket, a muster in chancery: he was twice married, and had several children by both his wives. 1 Life by Dr. Plume, prefixed to his Sermons. Gen. Dict. Biog. P.rit. —Ath. Ox. vol. II. See a letter in the —Gent. Mag. vol. LXVl. on his tomb and epitaph, written, if we mistake not, by Mr. Gougli.